It is quite ironic that I never got to know the cuisines of the other Southeast Asian countries until I moved away from the Philippnes and came to London. Being a melting pot of different cultures, the food here is so varied and interesting. There used to be an Oriental shopping centre here in our area and it was like "coming home" each time we went there. All the Southeast Asian cuisines are represented and it is like having a multi-national hawker street right in our neighborhood. Unfortunately, it had to be closed down because of some redevelopment plans. We can't get over our loss and are sad each time we remember the place. One of my the things I miss most is the Vietnamese food stall. Bun cha, Pho and Cha Gio (Vietnamese fried spring rolls) were my favourites. These days, I just have to make my own version of the food that I miss. 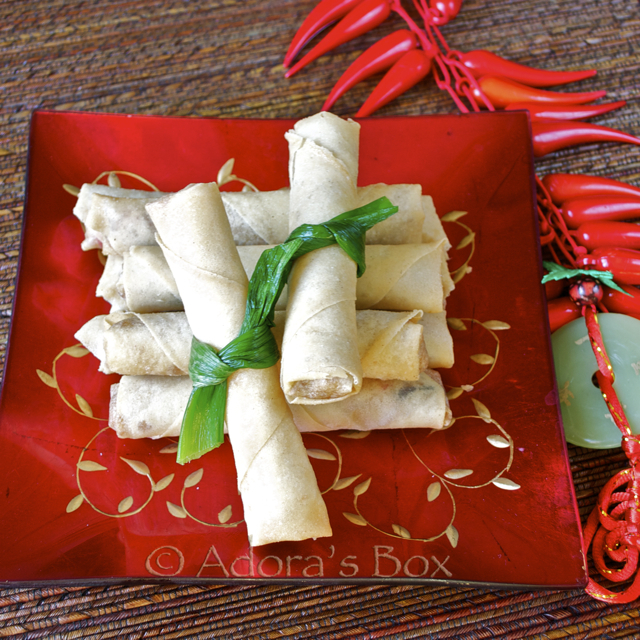 Here's my take on Cha Gio, the Vietnamese fried spring rolls. Put all the ingredients in a mixing bowl, except for the rice paper and the cooking oil, and mix thoroughly. Place one rice sheet (do this one at a time so they don't stick together) in a dish with warm water for 1 minute. Make sure both sides are wet. Take out of the water and lay on a clean kitchen cloth to absorb the excess moisture. Put a heaping tablespoon of filling on one side of the wrapper, pat into a long shape and fold over. Fold the two sides towards the center and roll tightly. Do not soak the rice paper for too long. It is difficult to handle when it's too soft. Like cling film, it sticks to itself. Deep fry, a few pieces at a time for about 4 minutes. Do not try to separate them if they stick to each other in the pan because this will cause the spring roll to come apart. Leave it to cook that way. It is ready when it is crisp and blistered. Leave to cool for a few minutes before cutting into bite sized pieces. 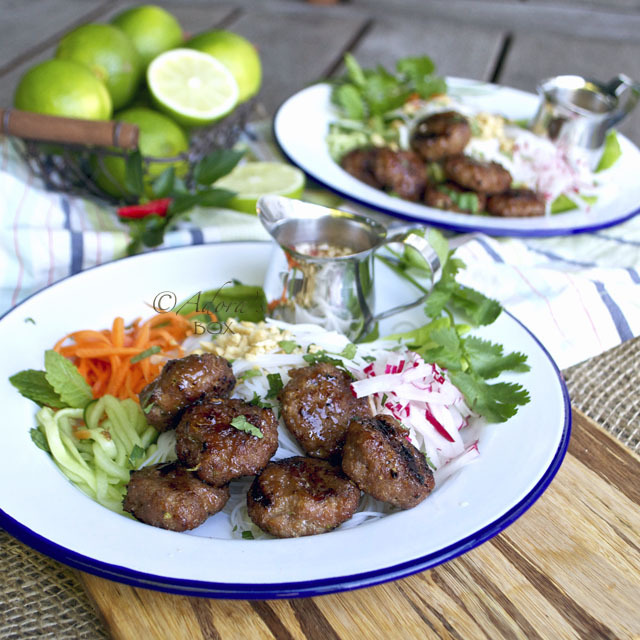 Serve with lettuce, coriander and mint leaves. To eat this, wrap a few pieces in a lettuce leaf, add some coriander and mint, dip in the sauce. 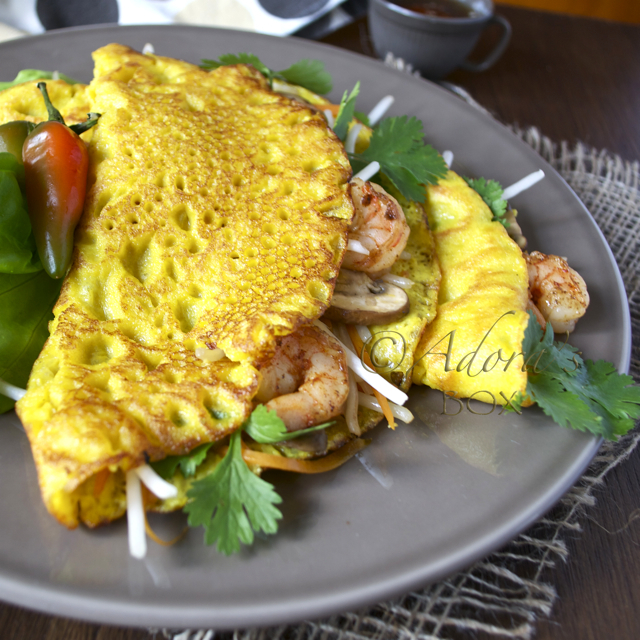 Combine all the ingredients together and serve with the spring rolls. These are GREAT! They remind me so much of Lumpia! I lived in the Philippines when I was a child back in the 70s and the food was so delicious I still think of it! Thanks for sharing - these are really spectacular! They are so crunchy and delectable! Your spring rolls look perfectly done! Gorgeous pictures too! These are a little harder to make and fry but the good thing is that they are gluten free. Your spring rolls always look so delicious and these are no different. Making these does take some talent, but this has inspired me to try. Great post. They look so delicious! Especially love the garlicky dipping sauce. Thanks Adora for sharing this! I never thought of "frying" these rice paper. I always make them but just the regular ones... They look delicious! The spring rolls look great. You've hit the spot with your filling. It is all the stuff we'd have in ours as well. And even better; you used rice paper! I alwasy use the chinese springroll paper which is not made of rice! It's crunchy, but not sticky as it should be. 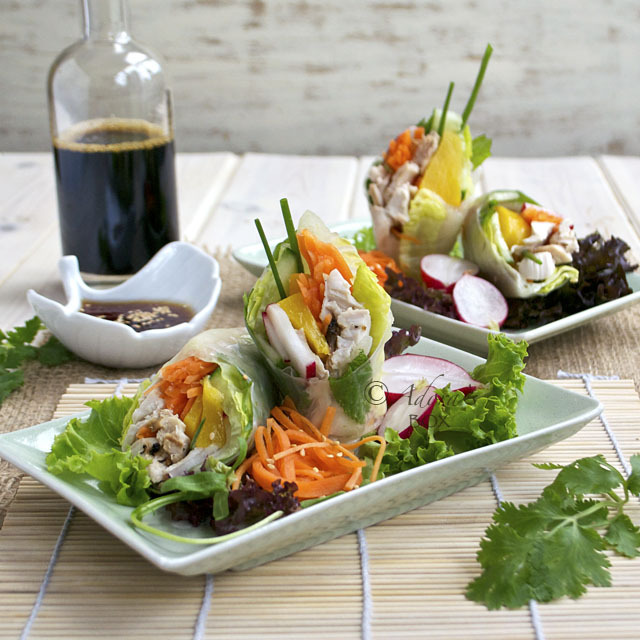 Your spring rolls look so pretty. I made my first spring rolls the other night and learned I am not so good at rolling them!!! I love how you used the rice paper wrapper then fried it! Must be SO good. Wow! 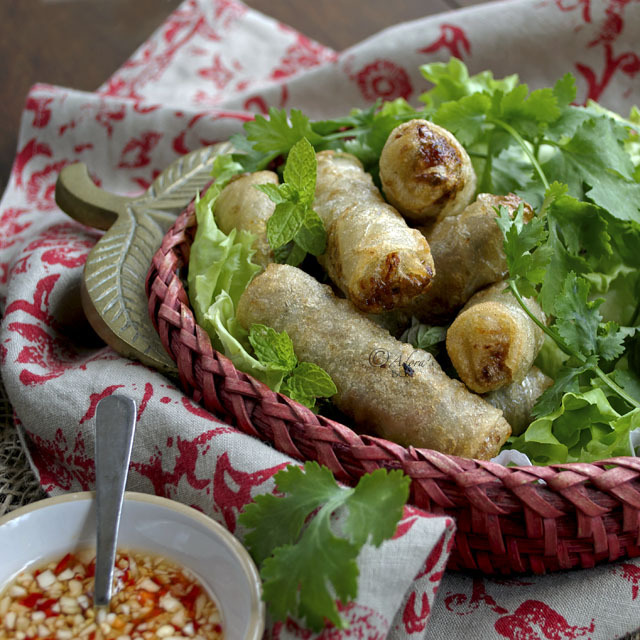 Your spring rolls look so crispy and delicious! I think I could eat more than I care to admit! YUM. These are fantastic, Adora! I'm a huge fan of Vietnamese cuisine and only wish I was better versed at cooking it! That is one delectable Vietnam rolls. It reminds me of chinese bean sprout rolls in spicy vinegar. I'm gonna enjoy this one. I always get rolls when I go out to eat. Yours looks delicious, I should really try making them at home! Yuuuum All your food ALWAYS looks to die for! Your photos are always gorgeous and the food is always really well presented too :) I could eat everything on your blog and nothing else!! I love Vietnamese eggrolls. It reminds me of Lumpia Sariwa in the Philippines except this wrapper is made of rice sheets. But to be honest, I haven't tried them fried, so it's something new for me to try. Thank you for sharing the recipe, Adora. This has been my youngest daughter's favorite since the first time she tried it at a friend's house. She now loves it more than Filipino eggrolls so I frequently make it, but I use ordinary spring roll wrapper instead of rice paper. I find it easier to use. But I love how you made yours! It's very much like the original version! So gorgeously crispy! 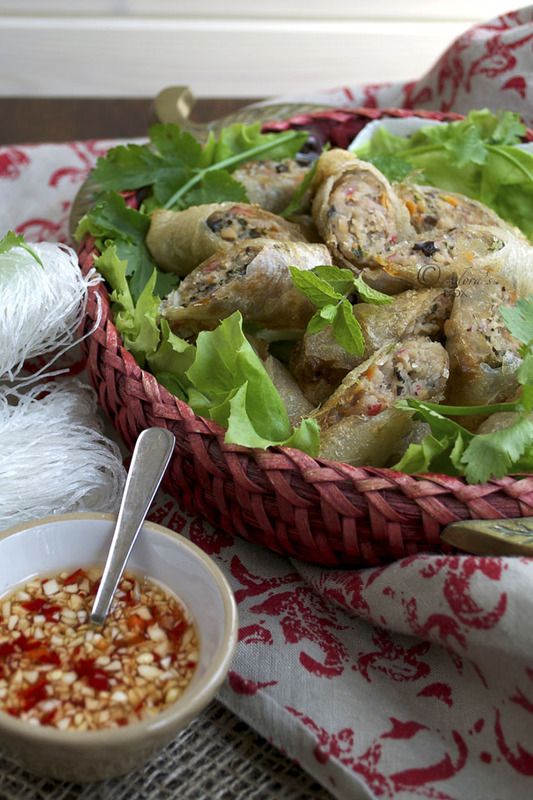 Fried rice paper springrolls, what could be more perfect? I've actually only eaten these untried so I can't wait to try your version. I want to order these whenever I go to the Vietnamese restaurant, but sometimes I resist. These look perfectly golden. These look amazing! 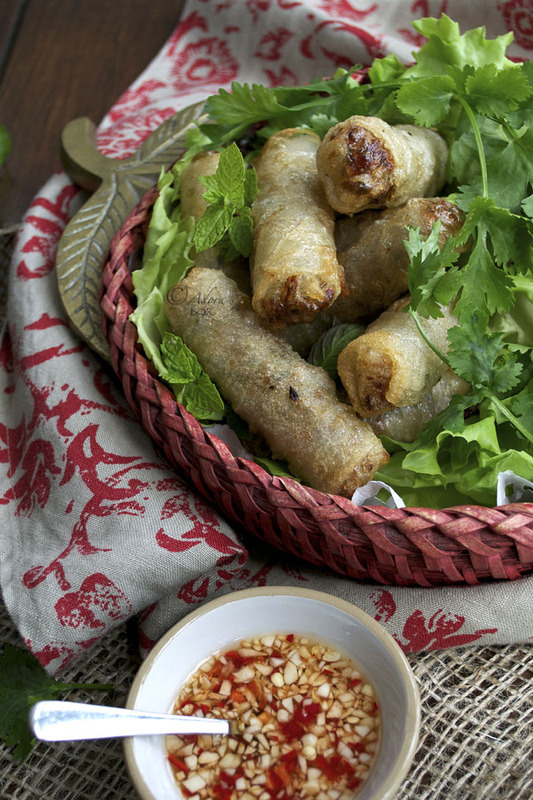 Vietnamese spring rolls are one of my all-time favorite foods!